Do you look at your small bathroom and think, what difference would a bathroom remodel make? Have you lost hope of ever having a master bathroom design that meets your lifestyle requirements? Fear not! While you may dream of having a spacious, luxurious master bath, why not love the space you have now by maximizing its value. An experienced bathroom remodeling professional can help you find clever ways to make the most of your available space. The best way to illustrate this is through an example, using this recent bathroom renovation in Langhorne, PA. In the case of this bathroom remodel, we looked at the overall floor plan and determined the best approach was to move a wall. Okay, this means we did not technically stick to the existing space, but the key lesson is to look beyond what you see in front of you. Remember you can move walls, change the layout, or shift plumbing around in a renovation. It may not be possible every time, but you would be amazed at the dramatic effect it can have on the design. In this case, we moved the wall less than 2 feet to make this design worthy of any extreme makeover television program. It added just enough space to allow us to completely alter the layout and make the most of the design. When in doubt, opt for the best shower possible. Small bathroom designs typically go for the traditional shower/bath combination. This is a perfectly acceptable option, but if you find this to be old fashioned and do not have sufficient space for a separate shower and bathtub, it may be time to toss the tub. Do you really use it anymore? If the answer is no, then maximize your available space to get the best shower possible. In this bathroom remodel, we utilized the altered layout to install a luxurious shower design, as illustrated in these before and after pictures. You may think your room is too small for a vanity, but they come in all shapes and sizes to accommodate almost any bathroom design. While your bathroom is likely not too small for a vanity cabinet, it is too small for clutter! A vanity cabinet, even a small one, offers valuable storage to keep all your bottles, tubes, and brushes organized. This means any counter space you have is available and floors stay clear. This small bathroom design in Langhorne, PA took full advantage of the revised layout to upgrade the vanity cabinet. The vanity is much larger, but fits neatly into the space so it does not overpower the room. Your storage opportunities do not end with the vanity. Think creatively about your space and look for every opportunity to fit useful storage without encroaching on the floorspace and elbow room. Shower storage in the form of a built-in niche or corner shelf is a good place to start. 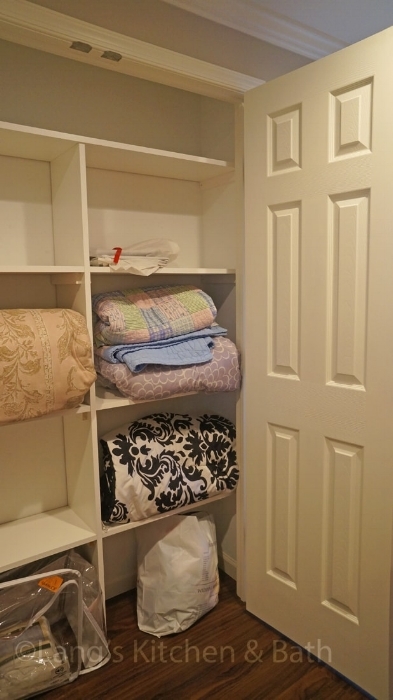 A narrow, recessed cabinet may fit neatly along one wall. If space allows, include a linen cabinet like we did in this bathroom remodel. Bonus: tearing down walls is an excellent opportunity to overhaul the adjacent room! If your remodeling plans involve moving walls or any other structural changes, this is a prime opportunity to examine the adjacent room or hallway to see if anything needs to be updated. In the case of this renovation, moving a wall between the bathroom and bedroom made the bedroom our main target. We revived the outdated space by replacing the old carpet with luxury vinyl flooring and by adding custom closets to offer much needed storage. Find out more about this small bathroom design transformation here and check out our other projects to see more tips and tricks for making the most of your space. If you are frustrated with an existing home living space, contact us today to find out how we can help you!